Stop the presses --- there's been yet another change to the writing staff at Guiding Light. In a remarkable twist mimicking the current Presidential Election process, Procter & Gamble Productions has announced that Claire Labine will remain head writer of Guiding Light. "The Labines have always had the popular vote. We decided to take a recount, and in so doing, we found another vote in the Electoral College," says P&G's executive-in-charge of production Mary Alice Dwyer-Dobbin. 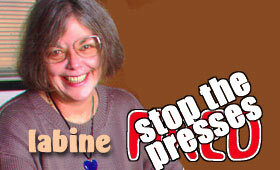 The head writer spot has been vacant for barely two weeks, however Labine seems pleased to be returning to the show. "We are happy to acquiesce to the will of the majority," she says. "[Writing team members] Matt, Eleanor and I were delighted to join Guiding Light in June, and even though we never left the building, we're delighted to come back to [the show] in December." According to an official press release, the Labines will return to writing duties beginning in December. Questions have now surfaced about a possible difference of opinion between the folks at CBS and Procter & Gamble. "CBS wanted to Labines gone so that they could improve the show," one insider remarks. "But [Procter & Gamble] doesn't seem to want things to get any better." In bringing the Labines back to Guiding Light, executives appear ready to fend off the reports that the show is in jeopardy of being cancelled. A recent New York Post article hinted that the show's low ratings made it a target for cancellation. Show execs were quick to deny the reports, but things spun out of control when the Labines were removed from their posts and several high-profile actors were released from the show. "CBS has no plans to cancel its long-running daytime drama, Guiding Light. The series has been a fixture on the network since its television premiere in 1952, " says the network in an official statement. "Like its millions of fans, we look forward to many more episodes featuring the high-quality drama and the compelling characters that we've come to expect from Guiding Light."